I grew up in Minnesota, the Land of 10,000 Lakes. My father was an avid fisherman, and my brother and I were included in many fishing trips from the time we were old enough. We fished from shore on little lakes, from fishing boats on big lakes, in an ice house in the dead of winter, and we walked through herds of cows (with the farmer’s permission, of course) to fish the shore of the Minnesota River. I think I learned to catch, gut, scale and cook a fish when I was about 9 years old. Every summer for my father’s two week vacation, we would stay at a resort on Woman Lake in northern Minnesota. We had our own little rustic cabin in the pine woods facing the lake and the big L-shaped dock. Each cabin had its own fishing boat with a motor. So we fished off the dock with a drop line and from the boat farther from shore. A couple times a week the resort would put on an outdoor fish fry and we would have a communal picnic. Beer batter. Wood fire. Yum. When I was about 14, my dad bought his own cabin on a small lake in northern Minnesota and we spent every weekend there, doing…guess what… fishing! We would catch little Sunfish off the dock, walleyes in deeper water. Sometimes I would take our fishing boat out and troll around the one shallow weedy side of the lake. I would hang my fishing pole out the back of the boat with a little lure on the line and if I was lucky, I would get hit by a northern pike. They were really fun to catch, feisty and strong, sometimes jumping out of the water. Those were the days. Here we are, my dad and I, in June of 1949. I am 4 years old and he is 32. That fish, which is a Northern Pike or Muskie, is bigger than I am and, of course, had to have its picture taken. 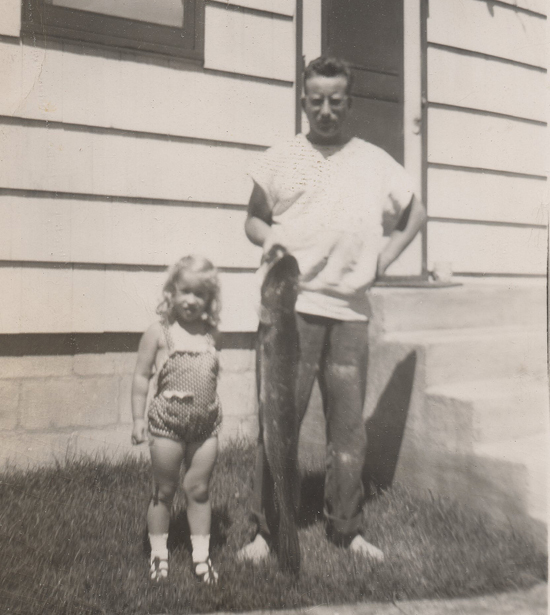 I have boxes of photos of my dad with the fish he had caught through the years; in fact, there are so many, I am surprised there were any fish left for anyone else to catch. Lol. My dad’s birthday was in July, so I had to celebrate it with this fish recipe in his honor. Also making their appearance in July are my favorite summer fruit, Rainier Cherries. 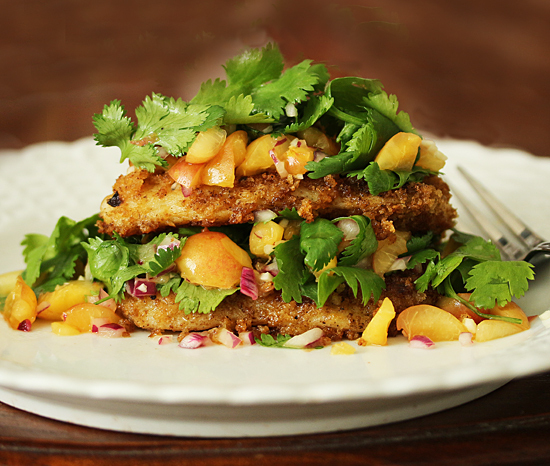 What better combination than a white fish fillet coated with Chipotle Panko and topped with Rainier Cherry Salsa. The Sweet Chipotle Panko Bread Crumbs are a Kroger/Ralphs item and are made up of panko, sugar, salt, chipotle pepper, spices, garlic, cumin, oregano and sweet chili peppers. 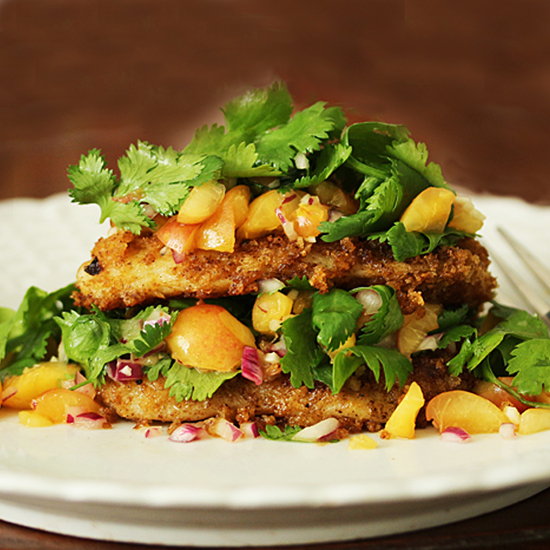 Crunchy, a little sweet and with a little chili heat. If you don’t have this at your market, I’d bet you could mix up a little bowl with these ingredients that would be a DIY version. It’s definitely worth a try. Here’s to you, Dad, up there in that big fishing boat in the sky. Happy Birthday! 1. Place beaten egg in a flat bowl and chipotle panko crumbs in a second flat bowl. 2. Melt butter in olive oil in sauté pan large enough to hold fillets over medium heat. 3. Submerge one fillet in egg and then in panko, making sure to thoroughly coat the fillet. Place fillet in butter in pan. Repeat with second fillet. 4. Cook fillets until first side is brown. Turn over and cook until fish is opaque throughout. 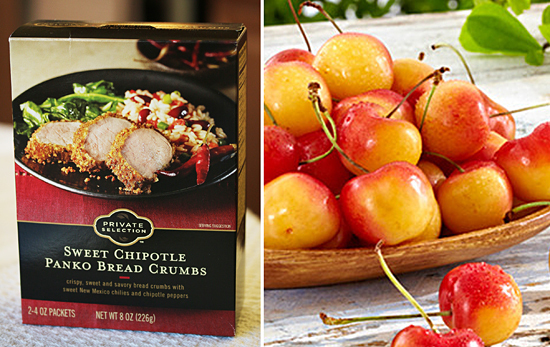 Serve with Rainier Cherry Salsa. 1. In a medium bowl, mix all salsa ingredients. Chill until ready for service. That looks divine. I have never had cherry salsa so I am very excited to make this recipe. this looks seriously tasty.. and wow that is a massive catch! ive never cooked with swai before, definitely missing out on something great. will be recreating this recipe in my kitchen. thanks for sharing! That pic is too cute! And the salsa sounds like a winner! Never heard of cherry salsa.